Mars Hill won the Div. 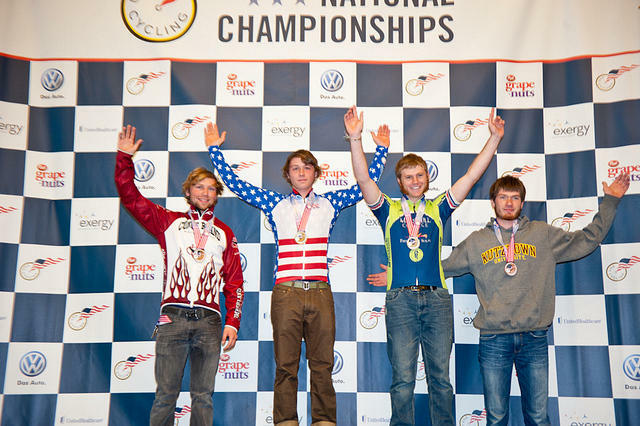 II National Championship last weekend at USA Cycling’s Collegiate Cyclocross Nationals in Madison, Wisconsin. Mariske Strauss won the women’s race, with Laura Rice finishing 7th. Tim Jenkinson finished 2nd in the men’s race, and Corey Davis was 8th. Those top-10 finishes, along with strong performances from Steph Bunnett, Lacey Douglas, and Michael Robinson, brought a decisive victory in the team competition, and also increased MHC’s lead in the overall D2 national team rankings. Mars Hill celebrates the team championship. Cumberland University takes 2nd and the US Military Academy 3rd. Mariske Strauss brought home the team's first women's individual championship. Tim Jenkinson claimed an excellent silver medal in men's race. Comments : Comments Off on National Cyclocross Champions! Cate Wood (in yellow) wins a moto. Cate Wood joins the team next fall as a leader on our newly minted BMX team. 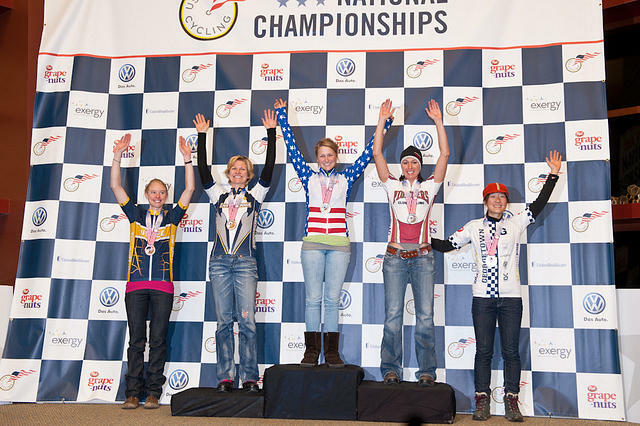 With national level experience in BMX, Cate’s addition to the team couldn’t be more timely–on December 16th, USA Cycling announced that BMX would be added to the national championship schedule for collegiate riders. 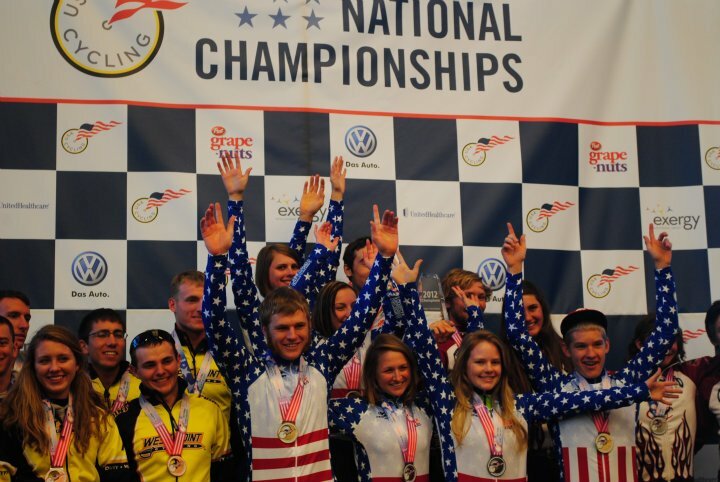 BMX will join road, mountain bike, cyclocross, and track as one of five collegiate disciplines sanctioned by USA Cycling. 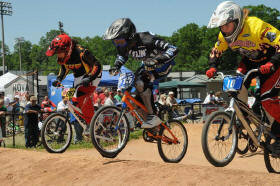 The first Collegiate National BMX Championship will take place April 1st in Chula Vista, California. Cate started racing in 2007, chasing trophies that were taller than she was, and quickly moved up to the expert class. After two years of training and hard work, she won her first moto at a national event in 2010, and then followed up with another big win on her birthday that year. Along the way, Cate demonstrated resilience by bouncing back from a hard crash that sidelined her with a concussion and broken ribs. During the 2011 NBL (National Bicycle League) season, Cate led the national points ranking all season before finally finishing 2nd on the year. 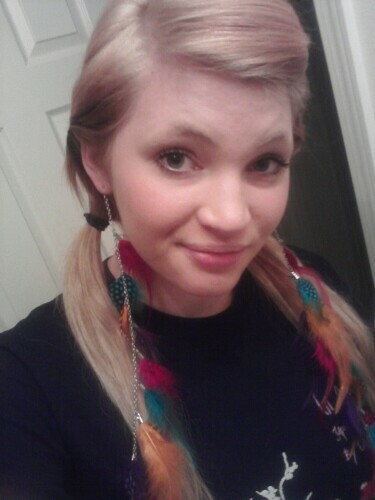 In 2012, she will race the Junior Elite class before she joins Mars Hill in the fall. While Cate will focus on BMX, she’s also excited to try the other collegiate cycling disciplines, where her skillsets promise to translate well. Cate is currently a senior at Cox Mill High School in Concord, North Carolina. In the interim before Cate joins the team, we are strategizing on how we can grow BMX internally at Mars Hill, and we hope to send a representative to nationals in April. Talks are also underway on how we can best partner with the local BMX track in Weaverville, which is only 10 miles from campus and will become our “home” track and training grounds.